BEIJING — China on Friday broadcast pictures taken by its rover and lander on the moon's far side, in what its space program hailed as another triumph for the groundbreaking mission to the less-understood sector of the lunar surface. The pictures were transmitted by a relay satellite to a control center in Beijing, although it wasn't immediately clear when they were taken. "The lander, its rover, and the relay satellite are all in a stable condition. 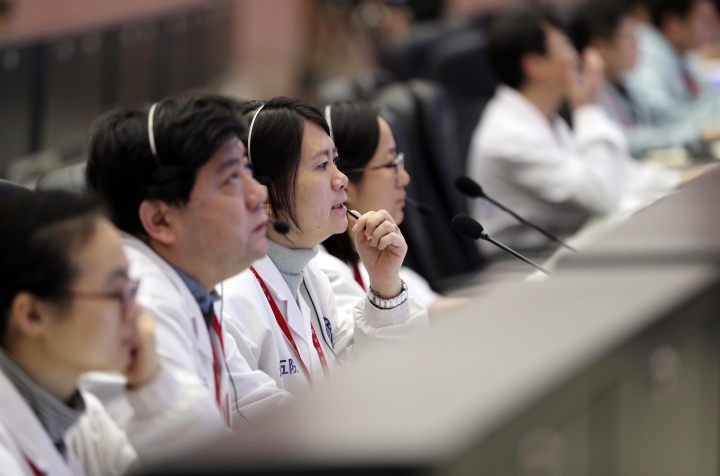 They have reached the predetermined engineering goals, right now they are getting into the stage of scientific searches," Zhang Kejian, director of the China National Space Administration, said before engineers at the Beijing center. "Now I declare that the Chang'e 4 mission, as a part of the Chang'e Lunar Exploration Program, has been a success," Zhang said. Pictures transmitted back show a rocky surface with the jagged edge of craters in the background, posing a challenge for controllers in plotting the rover's future travels, the official Xinhua News Agency said.